The Adriatic Sea’s turquoise waters provide the perfect conditions for aging Croatia’s acclaimed wines. Our correspondent goes diving for the best bottles. Legend has it that there’s treasure resting oﬀ the coast of Žuljana, a tiny town with roughly 250 residents located along the southern side of Croatia’s Pelješac Peninsula. And I’ve come here to fnd it. Scuba gear strapped on, I dive below the waters and come upon a cage resting at the bottom of the sea—the buried treasure, at last, in the form of seashell- and coral-covered bottles of wine. purposely by upstart winery Edivo Vina. Because who needs a subterranean wine cave when you have the stunningly beautiful turquoise waters of the Adriatic Sea? “It’s the perfect storage for the wines because the temperature is constant for the whole year,” says Dora Mratović, manager of the Edivo Wine Bar in Drače, a 15-minute drive away from the current dive site in Žuljana, and adjacent to the actual winery in Janjina. Mratović says the water constantly hovers around 59 degrees Fahrenheit, and wouldn’t you know it, that’s right in the sweet spot of the temperature range the wine industry has long coveted for storage and maturation. Dubbed Navis Mysterium, Latin for Ship’s Mystery, the wine spends between 18 months and two years underwater before it’s ready for release. With enough time, deeper and more nuanced ﬂavors develop, and rough edges are rounded out. The wine itself is made from the plavac maligrape, a ubiquitous varietal in and around the Dalmatia region of Croatia, and one that has risen in global prestige in recent years. “Plavacis related to zinfandel,” Mratović says. So it is that zinfandel, long the pride of American winemakers, actually has its origins in Croatia, where it’s known as tribidrag or crljenak. That history wasn’t successfully hashed out until about 20 years ago, led in part by California-based Croatian winemaker Miljenko Grgich. As for plavac, it’s a cross between tribidrag and another ancient Croatian varietal. It was the pleasure side of the operation that took charge at frst, resulting in some casual experiments before any business plan was hatched. “We started the project in 2009,” Mratović says. “A few bottles were sunk underwater for fun.” In 2012, the business began producing wine in earnest, with the wine bar opening in spring 2017. Dubbed Navis Mysterium, Latin for Ship’s Mystery, the wine spends between 18 months and two years underwater before it’s ready for release. Edivo currently partners with Diving Centre Barbara in Žuljana to lead would-be explorers to the dive site. There, a single cage of wine rests about fve meters below the surface. 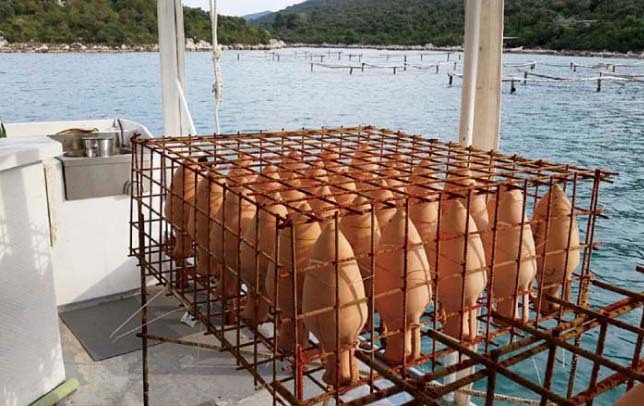 The bulk of the winery’s underwater production remains elsewhere, though, with several thousand bottles maturing in several semi-secret locations between 18 and 25 meters below the waters of Mali (or Little) Ston Bay, on the other side of the peninsula. Mali Ston’s waters are known as the source of some of the world’s most sought-afer oysters, and the nutrientrich conditions are ideal for the wine, too. Because with Edivo, it’s not solely about the taste, but also its presentation. 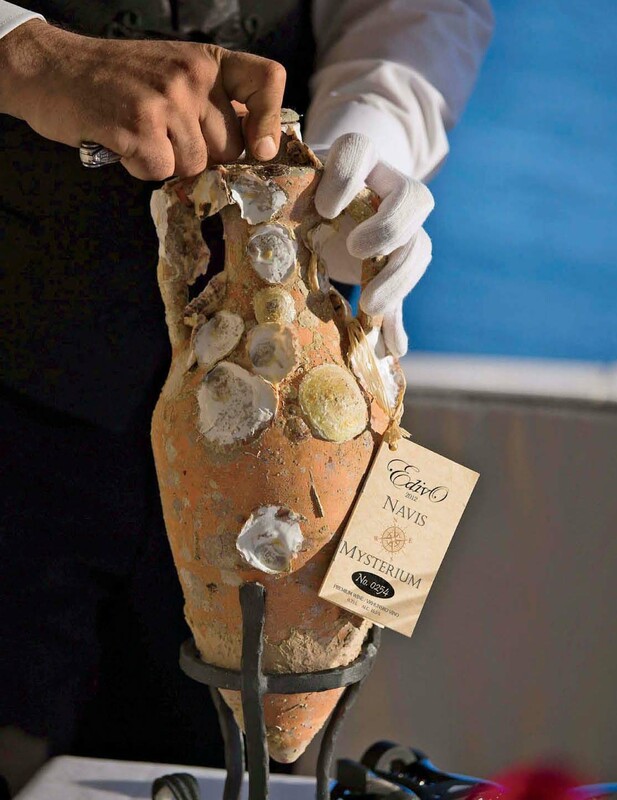 The bottles and amphoras themselves are covered with layers of shells, coral, and debris—the wine can be purchased as a standalone bottle for $81 or with an amphora for $337—delivering showstopping souvenirs with a one-of-a-kind presentation. 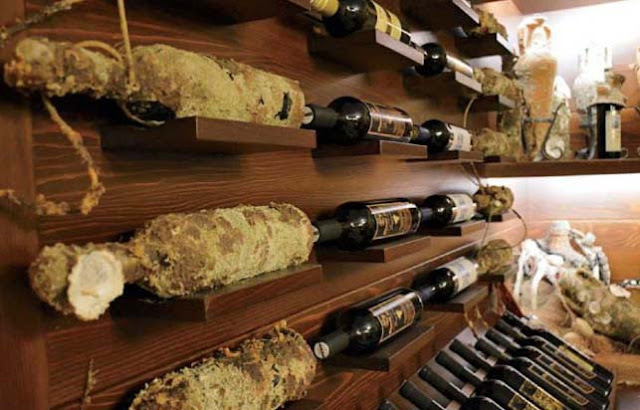 Visitors to the wine bar pick the pecifc bottle or amphora they’d like based on its appearance; therefore, storing the wine in the type of conditions that help build that aesthetic is crucial.